These Terms and Conditions of Sale of The Neat Company, Inc. (“Neat”) apply to sales of Neat’s products and services. A copy of these Terms and Conditions of Sale are available from Neat’s website at neat.com/policies/privacy-policy/. By placing orders by telephone or through our websites, you (“you” or “Customer”) accept, without limitation or qualification, these Terms and Conditions of Sale. If you’re signing up for Neat Cloud Service service with a minimum contract term, you’ll also find information herein about that contract term and what happens if you cancel your Neat Cloud subscription service early or don’t pay on time. A valid credit or debit card is required for purchase. Neat does not accept checks, gift cards or purchase orders as a means of payment. You will be charged in full at checkout for the product, sales tax (if applicable), and any accessories or service plans you selected. If you are dissatisfied with your purchase in any way, you may return the product within 30 days of the date of order for a full refund in accordance with the return policy below. bonus for signing up you will receive thirty (30) NeatVerify credits for Premium plan trials and one-hundred (100) for Business plan trials. By submitting your payment details, you accept the 30-Day Free Trial and authorize Neat to charge your credit card annually at the end of the trial period (annual charge of $149.99 for Premium and $249.99 for Business). Neat will send an email reminder a few days prior to your trial converting to a paid membership/subscription. However, you will not receive a notice from Neat once your free trial period has ended or that the paying portion of your membership has begun. Neat software subscription, you must contact Neat before the end of the Free Trial Period to terminate your Premium or Business Trial. Neat reserves the right to withdraw or to modify this Free Trial Offer and/or the Terms and Conditions of the Free Trial at any time without prior notice and with no liability. 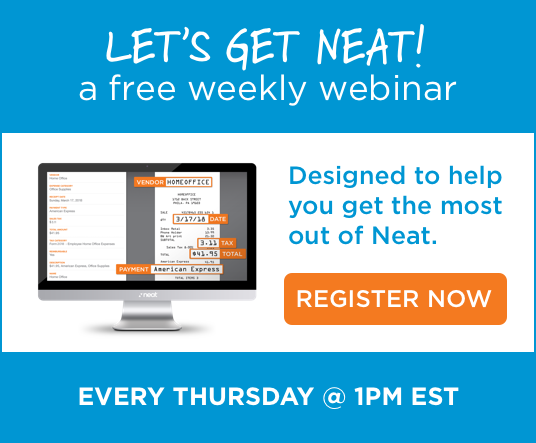 Neat is enrolled in the Visa® Account Updater and MasterCard® Automatic Billing Updater programs. These programs enable sharing updated account information between us and your credit card company. This process starts after we submit your recurring billing authorizations to your credit card company. If your card number or expiration date has changed since you placed your original order, we receive your updated account information. Once we receive your updated account information, we automatically update your payment profile and attempt to process the transaction. American Express® also has a recurring billing program similar to the Visa Account Updater and MasterCard Automatic Billing Updater programs. This program requires no action on our part. Once American Express receives your recurring billing authorizations from us, they internally identify your new card numbers or expiration dates. Then, they process transactions using your updated account information without sending it to us, so your payment profiles are not updated in Neat’s systems. To verify your issuing bank’s participation in the programs, please contact your credit card company. In the event you fail to make a required payment on the due date, all remaining payments shall immediately become due and owing. In addition, you will be charged a late fee of $25 per month on any past due amounts owed and, should your account be sent to an outside collection agency, Neat shall, in addition to the $25 per month fee, be entitled to reimbursement of all costs, expenses, and reasonable attorneys’ fees incurred in attempting to collect any outstanding amounts owed. NOTE: Requested cancellation of your active Neat Software subscription does not absolve you of any current balance due. NOTE: As of June 2017, Neat has ceased manufacture and sale of Neat-branded scanners. As such, ALL Neat scanners are now considered out of warranty and no further hardware warranties are applicable. Neat’s warranty does not apply if: (i) the product has not been operated within the environmental, mechanical, electrical, thermal or other operating condition limitations set forth in the applicable documentation; (ii) the product malfunction is the result of misuse, abuse, improper installation or application, accident, or negligence in use, storage, transportation or handling; or (iii) the product has been altered, packaged or otherwise modified or has been combined with other software, hardware or other materials. The liability of Neat for breaches of the above warranty is solely and exclusively limited to replacement, repair or credit at the purchase price at Neat’s sole discretion. ALL NEAT PRODUCTS ARE PROVIDED ON AN “AS IS” AND “AS AVAILABLE” BASIS FOR YOUR USE, WITHOUT WARRANTIES OR CONDITIONS OF ANY KIND, EITHER EXPRESS OR IMPLIED, INCLUDING WITHOUT LIMITATION THE WARRANTIES OF MERCHANTABILITY, FITNESS FOR A PARTICULAR PURPOSE, TITLE, NON-INFRINGEMENT, AND THOSE ARISING FROM COURSE OF DEALING OR USAGE OF TRADE. Certain Services offered by Neat may, in Neat’s sole discretion, require a subscription and may be limited to U.S. residents only. Certain Services offered by Neat may be used for remote storage of your data. These storage Services are only applicable to designated folders on your computer that pertain directly to Neat and are not a substitute for a back-up and recovery solution. Neat shall not be responsible or liable for any data lost or any failure of any storage service. Any data stored through Neat’s cloud storage services may be deleted 30 days following cancellation of your subscription or account, as applicable. YOU EXPRESSLY AGREE THAT THE USE OF ANY SERVICES PROVIDED BY NEAT IS AT YOUR SOLE RISK. ALL NEAT SERVICES ARE PROVIDED ON AN “AS IS” AND “AS AVAILABLE” BASIS FOR YOUR USE, WITHOUT WARRANTIES OR CONDITIONS OF ANY KIND, EITHER EXPRESS OR IMPLIED, INCLUDING WITHOUT LIMITATION THE WARRANTIES OF MERCHANTABILITY, FITNESS FOR A PARTICULAR PURPOSE, TITLE, NON-INFRINGEMENT, AND THOSE ARISING FROM COURSE OF DEALING OR USAGE OF TRADE. WE DO NOT WARRANT THAT THE SERVICES WILL OPERATE ERROR FREE OR THAT YOU WILL BE ABLE TO ACCESS OR USE THE SERVICES AT TIMES OR LOCATIONS OF YOUR CHOOSING. Neat may modify the specifications of products or the features of services at any time without notice and may substitute delivery of such products provided such modification does not, in Neat’s sole judgment materially affect form, fit or function. Neat is not obligated to continue production of any product or continue offering any service. From time to time, Neat may offer services for you to purchase or try. You may be permitted to access such services in a variety of manners such as through a web portal or through a client distributed by Neat. In order to use a service, you must: (i) be age 13 or older, (ii) agree to these Terms and Conditions of Sale, (iii) create an account by completing the registration process, and (iv) have a suitable connection to the Internet (which is not provided by us). As the service will continuously evolve over time, we reserve the right to modify these requirements at our sole discretion. You hereby represent and warrant that all information that you submit during the registration process is true and accurate. You are responsible for maintaining the confidentiality of your account username and password. You agree to notify us immediately of any unauthorized use or theft of your account or any other breach of security (and to provide properly documented evidence as reasonably requested by us). As the account holder, you are responsible for any and all actions taken by any person that has attained access to your account. If you breach these Terms and Conditions of Sale, Neat may terminate your account or otherwise suspend or terminate your access to the service. You are solely responsible for obtaining the equipment and telecommunication services necessary to access the services, and all fees associated therewith (such as computing devices and Internet service provider and airtime charges). All right, title and interest, including all copyrights, in and to such items (including but not limited to any images, photographs, animations, video, audio, music, text, and functionality), any accompanying printed materials, and any copies of all or any portion of the source code contained in the services or client application, are owned by Neat. All rights not expressly granted to you are reserved by us. You are encouraged to provide feedback to us regarding the service, including but not limited to usability, bug reports and test results (collectively “Feedback”). It is expressly agreed that all rights, title and interest, including all copyrights, to all Feedback is owned by us. You hereby assign and convey to us any rights and interests in any such Feedback you may have, create or provide during the term of this Agreement. To the extent that such assignment is held to be invalid or unenforceable, you hereby grant to us a perpetual, exclusive, transferable, royalty-free license to use any Feedback. You may be permitted to upload content to the services in various forms (collectively, “User Content”). By providing any User Content, you agree that it will not: (i) infringe any copyright, trademark, patent, trade secret, or other proprietary right of any party; (ii) be profane, obscene, indecent or violate any law or regulation; (iii) defame, abuse, harass, threaten or otherwise violate the legal rights (such as rights of privacy and publicity) of others; (iv) incite discrimination, hate or violence towards one person or a group because of their belonging to a race, a religion or a nation, or that insults the victims of crimes against humanity by contesting the existence of those crimes;(v) include your social security number, which you agree to redact from any User Content; (vi) contain any information the accidental disclosure or theft of which would cause you severe or irreparable harm or (vi) restrict or inhibit any other user from using the service. We have no obligation to monitor User Content related to the service. However, we reserve the right to review User Content and take any action we deem necessary as to such User Content, including but not limited to editing or removing your User Content and/or suspending or terminating your access to Neat based on your violation of the rules specified here. You also agree to only access that User Content that is yours or that you have been authorized to access. You may not access any other user’s User Content. Some services provide features that allow you to share your User Content with others. Please consider carefully what you choose to share. If you share your User Content with others, Neat does not assume responsibility for any violations arising from your sharing of those documents. Neat is also not responsible if the users who access those shared documents fail to protect the confidentiality of your information. You may not institute, assist, or become involved in any type of attack, including without limitation denial of service attacks, upon the service or otherwise attempt to disrupt the service or any other person’s use of the service. Any such attempt is a violation of criminal and civil laws. In the event that you make or assist in such an attempt, we reserve the right to seek damages or criminal prosecution to the maximum extent permitted by law. You may not attempt to gain unauthorized access to the services, others’ accounts whether through hacking, password mining, false key creation, or any other means. You may not obtain or attempt to mine any information from the services through any means not intentionally made available by us through the Client Application. You may not reverse engineer, decompile or disassemble the services, including any proprietary communications protocol used by the services. Only we may host Neat services. You may not establish an emulated service environment, regardless of the method used to do so. Such prohibited methods may include, but are not limited to, protocol emulation, reverse engineering, modifying the Client Application, adding components to the Client Application, or using any utility program to host the service in any manner. IN NO EVENT SHALL NEAT BE LIABLE TO CUSTOMER, WHETHER AS A RESULT OF BREACH OF CONTRACT, AN EQUITABLE CLAIM, WARRANTY, TORT (INCLUDING NEGLIGENCE), FAILURE OF A REMEDY TO ACCOMPLISH ITS PURPOSE OR OTHERWISE, FOR SPECIAL, INCIDENTAL OR CONSEQUENTIAL DAMAGES INCLUDING BUT NOT LIMITED TO, LOSS OF PROFITS OR REVENUE, LOSS OF USE OF THE PRODUCT OR SERVICE, LOSS OF DATA, DAMAGE TO ASSOCIATED EQUIPMENT, REWORK, RECALL COSTS, DOWNTIME OF PLANT OR EQUIPMENT, COST OF SUBSTITUTE EQUIPMENT OR PRODUCTS OR CLAIMS OF CUSTOMER’S CUSTOMERS FOR SUCH DAMAGES. IN NO EVENT SHALL NEAT BE LIABLE TO CUSTOMER, WHETHER AS A RESULT OF BREACH OF CONTRACT, AN EQUITABLE CLAIM, WARRANTY, TORT (INCLUDING NEGLIGENCE), FAILURE OF A REMEDY TO ACCOMPLISH ITS PURPOSE OR OTHERWISE, FOR AN AMOUNT IN EXCESS OF THE AGGREGATE MONIES ACTUALLY PAID TO NEAT COMPANY FOR THE PRODUCT OR SERVICE WHICH GIVES RISE TO THE CLAIM(S). Customer’s use of products and services are at Customer’s own risk, and Customer shall defend, indemnify and hold Neat harmless from all liability and costs (including court costs and attorney’s fees) resulting from claims, demands, or actions brought against Neat by anyone (including without limitation any injuries or property damage) caused directly or indirectly by (i) Customer’s breach of the terms of these Terms and Conditions of Sale, or (ii) the actions or omissions of Customer with regard to Neat’s products or services. Neat’s sale of any products is expressly conditioned upon Customer’s acceptance of these Terms and Conditions of Sale. Customer’s taking delivery of all, or any part, of a product shipment is evidence of such acceptance. Any and all of terms and conditions presented by Customer which are different from or in addition to those contained herein hereby rejected, and of no effect. Customer may not, whether intentionally or unintentionally, violate any applicable local, state, national or international law or regulation in connection with your use of Neat, including, without limitation, making available any material or information that infringes any copyright, trademark, patent, trade secret, or other right of any party (including rights of privacy or publicity). Neat shall be excused from performance, and have no liability from any such non-performance under these Terms and Conditions of Sale, where such non-performance is caused by an event beyond Neat’s control, including but not limited to, acts of government, whether in sovereign or contractual capacity, war, civil disturbances, terrorism, material or manufacturing unavailability, labor difficulties or disputes, failure of or delay in delivery by Neat’s suppliers or carriers, commercial impracticability (irrespective of foreseeability at time of contracting), shortages of energy, raw materials, labor, or equipment, inadequate yield of product despite Neat’s reasonable efforts, accident, fire, flood, storm or other Acts of God. Customer shall not assign these Terms and Conditions of Sale or any right or interest therein without the prior written consent of Neat. Any assignment in contravention of the foregoing shall be null and void. These Terms and Conditions of Sale supersede all previous communications, transactions, and understandings, whether oral, or written, and constitute the sole and entire agreement between the parties pertaining to the subject matter hereof. No modification, deletion or waiver of, or addition to these terms shall be binding on Neat unless made in writing and signed by a duly authorized representative of Neat. These Terms and Conditions of Sale are governed by the laws of the Commonwealth of Pennsylvania, USA, without regard to its choice of law provisions. The courts of general jurisdiction located within Philadelphia, Philadelphia County, USA, will have exclusive jurisdiction over any and all disputes arising out of, relating to or concerning these Terms and Conditions of Sale. The United Nations Convention on Contracts for the International Sale of Goods shall not apply to any sale hereunder. These Terms and Conditions of Sale shall be interpreted fairly in accordance with its terms and without any construction in favor of or against either party. A ruling by any court that one or more of the provisions contained in these Terms and Conditions of Sale is invalid, illegal or unenforceable in any respect shall not affect any other provision of these Terms and Conditions of Sale so long as the material substance of the transactions contemplated herein is not affected in any manner adverse to any party.